Good morning, Friends! I am so thankful it's Friday! This has been a tough week to get up in the mornings! I am looking forward to sleeping in tomorrow! I have a massage today and I really need it! I will probably end up falling asleep on her table - lol! I got my box of new product on Wednesday and have been playing around with the new stuff! Oh what fun!! I look forward to showing you what I've done! 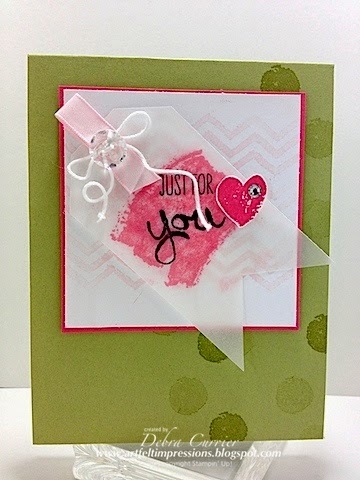 What a fun card, Deb, love how you used the new Work of Art stamp in your background. Thanks for playing with us at the colourQ. Terrific card Deb! So happy your could join us at the ColourQ!